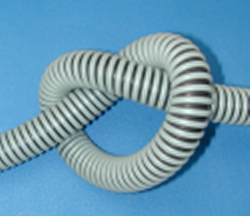 Our EPDM rubber hoses come with a corrugated exterior and smooth interior. We offer options in standard white and clear or a bright green. The wall thicknesses of these hoses are available in thicknesses ranging from 1 inch to 2 inches. These options also feature varying levels of bend radii and burst pressures to suit your needs. Please note: There are no returns on custom cut EPDM hose so please be sure you are ordering the correct size and length. The price you see is the price per foot on this custom length corrugated plastic tubing. Thank you.